a_coarseDomain is the domain at the coarsest level. a_grids is the AMR hierarchy. a_refRatios are the refinement ratios between levels. The ratio lives with the coarser level so a_refRatios[ilev] is the ratio between ilev and ilev+1 a_coarseDx is the grid spacing at the coarsest level. a_bc holds the boundary conditions. a_alpha is the identity constant coefficient a_beta is the laplacian constant coefficient. a_aCoef is the identity spatially varying coefficient a_bCoef is the laplacian spatially varying coefficient. 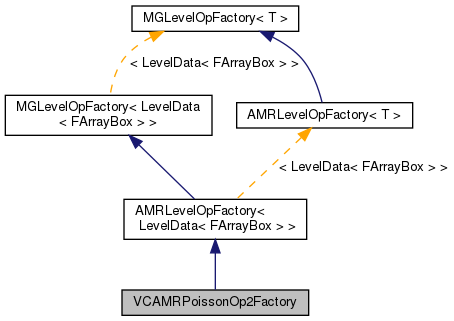 Defines a factory for VCAMRPoissonOp2 which allows the operators to allocate their own coefficient data. and coefficients are initialized to 1.
a_coarseDomain The domain at the coarsest level. a_grids The disjoint box layouts for the various refinement levels. a_refRatios The refinement ratios between levels. a_coarsedx The grid spacing at the coarsest level. a_bc The boundary condition imposed on the solution. a_ghostVect The ghost stencil to use in the created coefficient data.